When I first started this blog I envisioned it including a large amount of Ohio posts, with some "road trip" posts sprinkled throughout to help break things up. Pittsburgh is such an easy drive for a large number of Ohioans and is the perfect location for a long weekend out of state if you don't want to travel far or spend a lot of money. On Good Friday we picked my brother up in Moon Township, PA and headed into the city to visit Colony Cat Cafe. Colony is Pittsburgh's first cat cafe and wine bar. We were first introduced to the idea of a cat cafe in Columbus at Eat, Purr, Love which has been going strong connecting cats with happy homes, as of the date of this post Eat, Purr, Love has completed 130 adoptions. Colony Cat Cafe opened February 16, 2017 and has been connecting cats from Animal Friends non-profit rescue with happy homes for the last few months. As of yesterday adoptions from Colony totaled 21. Anyone is welcome to walk into the cafe and wine bar without a reservation, but a reservation is highly recommended for a visit to the cat loft. Keeping the number of people in the cat loft at a minimum (only 10 people are allowed) helps to maximize everyone's enjoyment -- the cats will not be overwhelmed and you will get to spend more time with each cat. If you follow Colony Cafe on social media, they will post whenever there are walk-in spots available for the cat loft. Once we decided that we planned to visit Pittsburgh for the evening, I made our Colony Cafe reservation and that was about a month in advance. Remember that Colony Cat Cafe is only open Tuesday through Saturday. We arrived about forty-five minutes early for our visit, luckily we were able to snag $5 parking in the parking deck across the street. 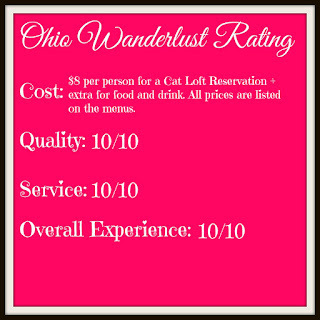 Colony Cat Cafe is located in a downtown area, so the parking deck and street parking are your only options. Penn Avenue is full of beautiful historic buildings, Colony Cafe is no exception. The ornate, high ceilings were amazing. Since we arrived early we ordered drinks and food to split. We finished our cocktails before heading to the Cat Loft, but you're also able to take your drinks upstairs. Just let the staff know and they'll put your drink in a plastic cup for you. This is the Felix -- Rocksov Vodka, Pinot Noir, Lime Juice, Agave Nectar, and Grapefruit Soda. This is the Henrietta Pussycat -- Boyd & Blair Vodka, Blackberry Preserves, Lemon, Sauvignon Blanc. All of the spirits served at Colony are produced in Pennsylvania. We also split a cheese plate during our wait, it was perfect for all four of us to share. Once it was time for our reservation we were able to go upstairs to The Cat Loft. The first friend we fell in love with was Grape Crush. She was very timid, but so sweet once she warmed up. This one was named London -- all of the cats wear a name tag on their collar, so it's easy to figure out who is who. Another sleeping kitty, Faygo managed to sleep throughout our entire visit. Aquarius looking very regal. The window he is next to looks out over the cafe itself. So from downstairs you can catch a glimpse of tiny faces and tails over the edge and from upstairs you can see how busy the cafe is below. There were kitties galore, everywhere you looked one was sleeping in the nearest basket or cat tree (pictured below is Butter). There are plenty of toys around to be used to entertain everyone who is awake. The night we visited Colony two cats were picked up to go stay in their forever homes. 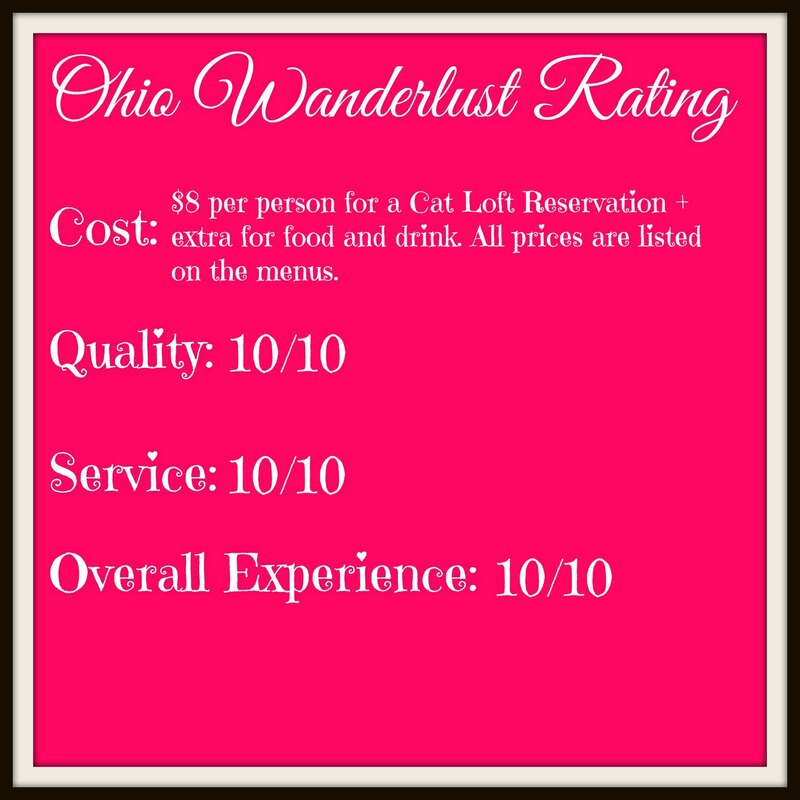 In the week since we visited we've been encouraging friends to add Colony Cat Cafe to their itinerary during their next trip to Pittsburgh and have suggested to a friend who is relocating to the area to consider visiting to see if there is a cat she would love to adopt. Everyone at Colony was incredibly nice and the food we ordered was fantastic. I think such a modern concept will do well in any major city such as Pittsburgh and I hope to see Colony have as much success as our "local" cat cafe Eat, Purr, Love.